Mercedes Hyper concept cutaway showing major components. First off: What is a hybrid car? Basically, it’s a normal, fuel efficient car that has two motors - an electric motor and a gasoline powered motor. It also has a special system to capture braking energy to store in an onboard battery. Why a hybrid? Why not a straight gas or electric powered car? After all, one of the basic rules of science is the more complex the system - two motors instead on one - the more often it will break down. This is the main reason many boat owners prefer one motor instead of the “double trouble” of two - despite the obvious safety advantages. This is a hard question and, in the minds of some experts, not fully answered. The reason for two motors is in the strengths and weaknesses of both types. Specifically, electric motors use no energy during idle - they turn off - and use less than gas motors at low speeds. Gas motors do better at high speeds and can deliver more power for a given motor weight. That means during rush hour stop and go driving, the electric motor works great and, as an added benefit, does not produce any exhaust thus reducing smog levels. At higher speeds - above 40 mph - the gas motor kicks in and gives that peppy feel so many car owners look for when driving on the highway. Another benefit of having the gas motor is it charges the batteries while it’s running. Many an electric car owner has been stranded just out extension cord range of an outlet. Hybrid owners can forget about this annoyance; the gas motors starts automatically when the battery gets low and proceeds to charge the battery - a hybrid never needs to be plugged into an outlet. Of course, if you forget to fill the tank…. Still, you can carry a gas can a half mile while a tow truck is necessary in a straight electric car. Hybrids are the most gasoline efficient of all cars - they typically get 48 to 60 mpg (claimed). Not bad, but only about 20% to 35% better than a fuel efficient gasoline powered vehicle - like the Honda Civic, for example, that gets 36 mpg. But, when comparing prices - hybrids cost from $19,000 to $25,000 and gas saver cars cost $14,000 to $17,000 - the justification to buy becomes less clear. Indeed, the difference in average annual fuel bills - $405 for a Honda Insight versus $635 for a Honda Civic - means you may never recoup the added initial cost of a hybrid. Over a ten year period owning a hybrid will save you only $2,300 - less than the cost difference for comparably equipped cars. Much of the fuel efficiency comes from improvements in aero dynamics, weight reduction and, the biggest change: a smaller, less powerful gas engine. In fact, any car will get substantially better mileage just by reducing the engine size. The main reason this is not done has to do customer demand - they want the extra power and zippiness. While the US has just started producing hybrids, the Japanese are the recognized leaders. 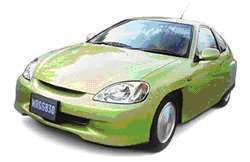 Honda and Toyota are the two largest producers with the Insight and Prius. US car makers are well behind. In fact, during recent introduction of a new hybrid by GM - the Mercury Mariner, they admitted they had to license over 20 separate technologies from the Japanese. US car makers still specialize in SUVs and trucks - Ford has even introduced a hybrid version of its popular Escape SUV. Industry analysts say US hybrids are just token models - not a serious attempt to get into the market. The reason for hybrid introduction has to do with Corporate Average Fuel Economy (CAFE) regulations. Current standards mandate that average mileage of the fleet of cars sold by an automaker should be 27.5 mpg. This means that if an automaker sells one hybrid car that gets 60 mpg, it can then sell four less efficient cars - like SUVs and trucks - that only get 20 mpg. 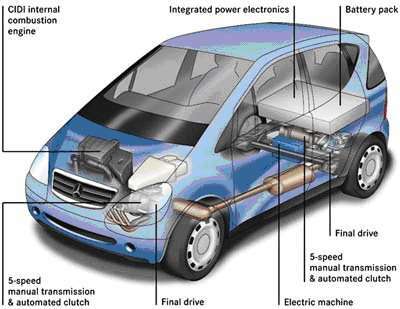 The motors and batteries in these cars do not require maintenance over the life of the vehicle. The engine doesn't need any more maintenance than in any other car. Because hybrids have regenerative braking, brake pads may even last longer than those in normal cars. Then, there is always the environment - always worth thinking about. A hybrid cuts emissions by 25% to 35% over even the most fuel efficient gas powered models. The tax incentive in the U.S. is another powerful motive - it can reduce your cost up to $3,400 depending on the cost of the vehicle. Better act fast, however, to get the model you want: the tax break only applies to the first 60,000 vehicles produced yearly by each manufacturer. 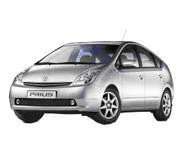 Toyota’s Prius, for example, will quickly reach that number of sales before year-end. Experts think in the end, hybrids are probably a transition technology. Hydrogen or methane fuel cell powered cars are probably the cars of the future. As for the environment, there are many ways to reduce emissions - using public transport, car pooling, riding a bicycle and even walking. Even just buying a smaller, fuel efficient car makes a big difference. So, think about what you are really trying to accomplish before buying a hybrid - don’t just throw your hard earned dollars at new technology for its own sake because it may be fashionably “green”.